The mission of an automatic fire detection system is detecting the fire as soon as possible, give the alarm and activate the preset control functions. Systems more advanced of fire detection can detect fire in its early stage and thus minimize the damage the fire could cause. Leaving aside those processes usually associated to explosions, fires usually develops more or less fast depending on the combustible material. Since there is enough quantity of the fire’s fuel and oxygen at the beginning, their development is determined largely by the available energy. So, since the flames release a lot of energy when they appear there is an exponential growth of the fire. The transition between the phase of flames and a total fire flames is called flashover (What is a flashover?). This is the explosive spread of the fire, which occurs exactly at the point where the gases and aerosols produced during previous phases swell up, spreading the fire to all the rooms in which they had previously penetrated these gases. Fire detection should occur as soon as possible and the intervention will begin before the flashover. Thus, incipient fires have to be detected in their early phase or in their latent phase, so that there is adequate time for the intervention. The problem is that the early phase and the latent phase may have a totally different intensity and duration. Some smoldering fires can continue at this stage for hours or even days before the open fire. 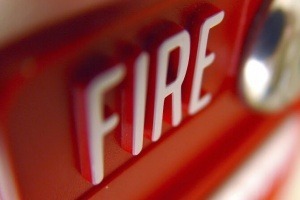 The earlier a fire is detected, more time there will be to fight and reduce the damage. Thus, the early detection is the key to minimize the damage and gain intervention time.